Completed at least 3 Daily Extends. Completed at least 1 Deep Dive Extend. Reflected on the Experimenter activities in a blog post and tweeted a link to the blog to @ontarioextend with the hashtag #oextend. Check out, try other activities in The Activity Bank. Or add new activities! Completed all of the activities? 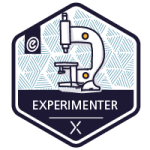 Apply for your Experimentor Badge!